In multithreaded application starvation is a situation when a thread is constantly ignored to gain possession of the intrinsic lock in favor of other threads. 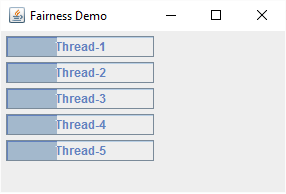 As seen above, it's evident that all threads are not given the equal chance to have equal CPU time. Some threads are starving for long time to acquire the shared lock. Fairness is the situation when all threads are given equal opportunity for intrinsic lock acquisition. As we saw in above example that the long running thread has more chances to aquire the lock again consecutively. 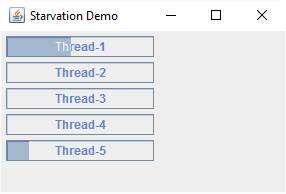 In general we cannot predict how underlying thread scheduler (built in O.S.) chooses the next thread for the lock acquisition. From developer perspective, the code should not hold the lock for a long time to make a thread greedy. We can fix the above code by using wait() method which releases the lock but goes to waiting state i.e. the scheduler cannot choose it for the lock acquisition again. That way other threads are given the equal opportunity to run. //simulate long running task with wait..